The silver fox (Vulpes vulpes) is taxonomically close to the dog (Wayne, 2001) but although reared in captivity, they had not been domesticated previously. Under standard farm conditions foxes normally exhibit distinct patterns of aggressive and fear-aggressive behavior to humans. Dmitriy Belyaev, and colleagues hypothesized that a selection of farm foxes for less-fearful and less-aggressive behavior would yield a strain of domesticated fox (Belyaev 1969, 1979; Trut, 1999). Selection for tame behavior was started at the Institute of Cytology and Genetics (ICG) in Novosibirsk, Russia in 1959 with 130 farm-bred foxes that demonstrated the least avoidance behavior towards humans. Subsequently, only the tamest individuals in each generation have been allowed to breed, while at the same time a deliberate effort was made to avoid inbreeding (Trut, 1999, 2001; Trut et al., 2004). The tame population developed relatively fast in response to selection – with 18 percent of foxes from the tenth generation demonstrated extremely tame behavior. Little behavioral variation was observed by 1985 and thereafter (Trut, 1999, 2001; Trut et al., 2004). The selectively bred tame foxes show behavioral patterns extremely similar to those of domestic dogs: by one month postnatal they become eager to establish human contact, whimpering to attract attention and sniffing and licking at humans, just like puppy dogs. To ensure that tameness results from genetic selection, foxes are not trained and are only allowed brief “time dosage” contacts with humans. In parallel with this selection for tameness, a second strain of foxes was bred selectively to preserve wild-type (“aggressive”) behavior (Trut, 1999, 2001). This aggressive strain was developed because foxes exhibiting wild-type behavior can be difficult to handle and, under farm conditions, even unselected foxes are subject to some degree of less-deliberate selection for relatively tame behavior. A rigorous testing system for assessment of behavioral phenotypes, has been established at ICG to enable selection of foxes for behavior (Trut 1980, 1999; Vasilieva and Trut, 1990). Experiments undertaken in the 1970s included experimental cross-breeding of tame and aggressive animals, cross-fostering of newborn pups and transplantation of embryos, and demonstrated the genetic basis of the tame and aggressive phenotypes (Trut, 1980, 2001). New experimental pedigrees have been developed more recently (2001-2004) by crossbreeding tame to aggressive foxes, and then backcrossing F1 animals to tame parents. Clear resegregation of the tame behavioral phenotype in the informative generations was observed (Kukekova et al. In press). Belyaev DK. 1969. Domestication of animals. Science (Russ.) 5(1):47-52. Belyaev D.K. 1979. The Wilhelmine E. Key 1978 Invitational lecture. Destabilizing selection as a factor in domestication. J Hered. 70: 301-8. Kukekova AV, Oskina IN, Kharlamova AV, Chase K, Erb HN, Aguirre GD, Lark KG, Trut LN, Acland GM. The Genetics Of Domesticated Behavior In Canids: What Can Dogs And Silver Foxes Tell Us About Each Other? In The Dog and Its Genome (ed E.A. Ostrander, U. Giger, K. Lindblad-Toh), Cold Spring Harbor. In press. Trut L.N. 1980a. The Genetics and Phenogenetics of Domestic Behavior. In Problems in General Genetics (Proceeding of the XIV International Congress of Genetics) v. 2, book 2, pp. 123-136. Mir. Moscow. Trut L.N. 1999. 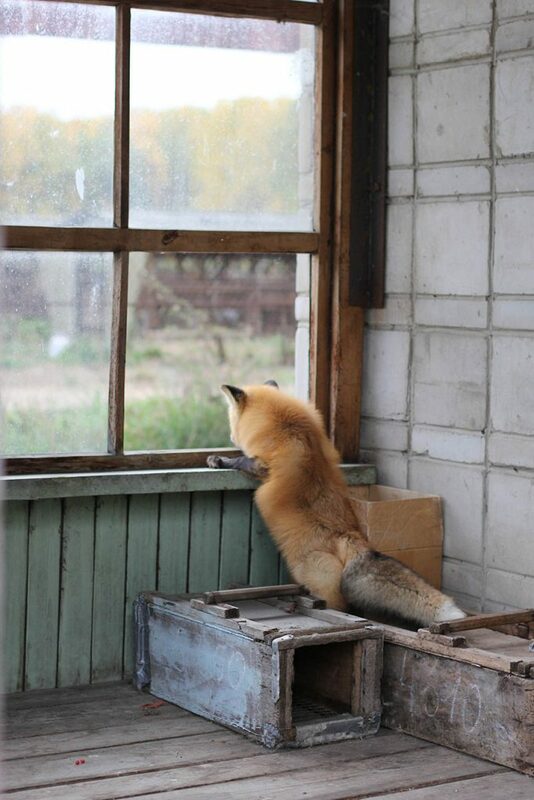 Early Canid domestication: The Farm Fox Experiment. American Scientist. 87: 160-169. Trut LN. 2001. Experimental Studies of Early Canid Domestication. In The Genetics of the Dog. CABI 2001, p.15-43. Trut L.N., Pliusnina I.Z., Os’kina I.N. 2004. An experiment on fox domestication and debatable issues of evolution of the dog. Genetika (Russ.). 40: 794-807. Vasilieva L.L., Trut L.N. 1990. The use of the method of principal components for phenogenetic analysis of the integral domestication trait. Genetika. 26: 516-24.